Chief of Staff Gen. John Kelly had told us, "This president has said from the beginning, I want everything out...I want the American people to know the truth". White House Press Secretary Sarah Huckabee-Sanders then told us “the administration will follow the same process and procedure" with the Democratic rebuttal to the controversial memo by Republican chairman of the House Intelligence Committee Devin Nunes. Alas, neither statement was true. Instead President Trump blocked release of the Democrats' attempt to fill in what FBI Director Christopher Wray said, referring to the Nunes opus, were "material omissions of fact that fundamentally impact the memo’s accuracy". The Nunes memo sought to expose the FBI, and in turn the special counsel, as biased and corrupt. Democrats on the committee are infuriated at what is irrfutably an attempt to create distrust in whatever charges their investigations bring. Instead of releasing what the Democrats intend to be a take down of the Republican memo, White House counsel Donald McGahn has told the Democrats they will have to work out with the Justice Department what can be seen by the public, alleging that portions of their counter-memo “would create especially significant concerns for the national security and law enforcement interests”, if disclosed. Democrats on the House Intelligence Committee, led by California's Adam Schiff, suspect that Justice will redact with a heavy hand parts which are not classified but which undermine the White House campaign, with readers none the wiser for not knowing what's behind the heavy black crossouts. As well, they expect deliberate delaying of the release until well after other newsbreaks  the Rob Porter imbroglio already proves the point  have displaced the memo saga in the public's attention. 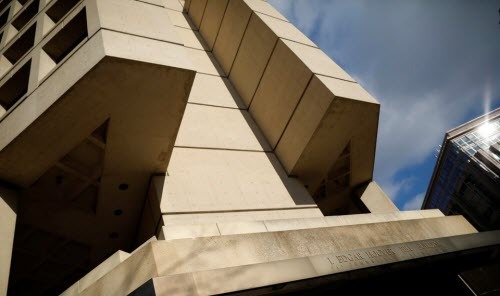 The FBI building in Washington, D.C.Intelligence Surveillance Act of 1978, the identity of its judges and its proceedings secret  to obtain clearance to spy on a U.S. citizen, in this case former Trump campaign associate Carter Page. The memo says the application failed to disclose that the document referred to as the "dossier", compiled by former British MI6 agent Christopher Steele, was the product of "opposition research" aimed at Trump and paid for by the Clinton campaign. (There was no mention in the memo that Republicans opposed to Trump had first funded Steele's research). The Nunes memo in turn fails to mention that, to demonstrate probable cause, FISA applications are voluminous, relying on considerably more than a single document and believed to run to 50 to 100 pages typically. As James Comey put it when FBI director, they were often thicker than his wrists. Other than the mention that the dossier is an "essential part" of the application, the memo pretty much leaves the reader thinking the dossier was pretty much it. That comports with the pre-memo Republican attempt to make what they always call the "unverified" dossier the trigger that set off the Russian probe. To successfully persuade us it was the genesis would make the Russian investigation a politically driven contrivance whose conclusions should be ignored. The memo then cites now-former FBI Deputy Director Andrew McCabe testifying to the committee in December that "no surveillance warrant would have been sought…without the Steele dossier information". Does that mean the FBI had too little else to rely on, or that the dossier was of course included as something that shouldn't be left out? Or neither. Two sources have told The Daily Beast that McCabe said no such thing. 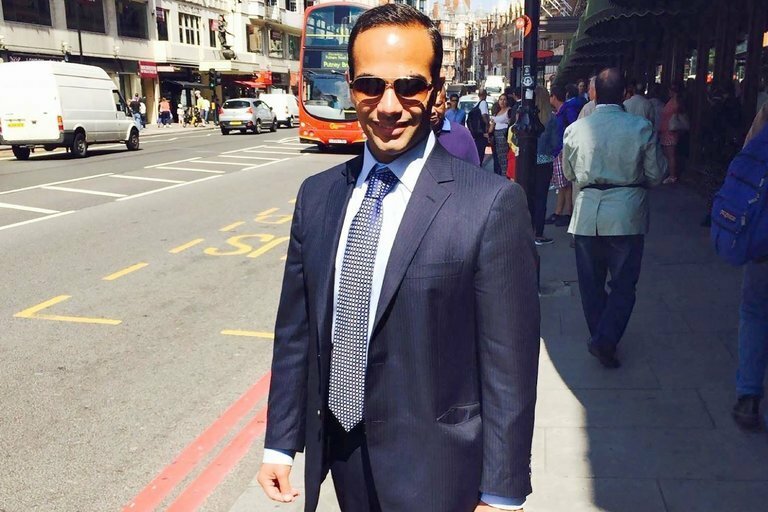 Former Trump campaign aide George Papadopoulos on a street in London. He has pleaded guilty to lying to the FBI about his Kremlin-related contacts. Clinton. The diplomat notified the FBI and their investigation was underway months before Christopher Steele came upon information in his explorations that caused him, too, to notify the FBI. The Nunes memo makes grudging admission that this was the true signal that launched the FBI investigation, but immediately points out that the inquest was begun by Pete Strzok, the FBI agent subsequently demoted for exchanging anti-Trump emails with his mistress. The first submission to the FISA court was on October 21, 2016, a fortnight before the election. Some members of Congress may have learned of it by then, but it didn't reach the media until December. (These pages covered it before most did.) So it would have been unlikely for FISA court members to have known of the dossier and a material omission not to have spelled out its provenance  at least that is the reasonable claim of the memo. Committee Democrats claim that the memo is incomplete, inaccurate and misleading. FISA warrants expire after 90 days. Renewal requires a "separate finding of probable cause" each time, as the memo recognizes. If the provenance of the dossier  that its research was paid for by the DNC and the Clinton campaign  was not known by the FISA court judges at the time of the first application, it certainly would have been known by them at the time of each of the renewals which spaned a year. It was all over the media. The memo sweeps in all the renewals as if they are as guilty as the original's sin, yet the judges evidently didn't object. The court kept giving the go ahead. "I think it's terrible, you want to know,...I think it's a disgrace what's happening in our country and when you look at that and see that and so many other things what's going on then a lot of people should be ashamed of themselves and much worse than that." Attorney General Jeff Sessions recusing himself from the Russia inquiry  he was compromised for having himself met with Russians  has never ceased to infuriate the president. He had put Sessions at the head of the Justice Department to protect him. In March he fumed "Where's my Roy Cohn", referring to the viperous sidekick lawyer at Senator Joe McCarthy's side whom Trump later engaged as his own counsel. The recusal put Rosenstein in charge of Robert Mueller and his investigation, the only one with the power to constrict the investigation or fire the special counsel. Trump had highly inappropriately asked Rosenstein if he was "on my team", to which the probably flustered deputy lamely answered, "we're all on your team" (when he should have answered that the Justice Department is on no one's team). But, once again, as with Comey and others, the lack of a one-to-one personal loyalty pledge puts Rosenstein in Trump's crosshairs. The president makes it obvious that he is searching for a pretext to fire the DAG so as to replace him with someone more malleable, someone who will go as far as firing Mueller. Now Trump can point to the memo as giving him that pretext: After all, wasn't Rosenstein party to what the memo claims is a fraudulent surveillance warrant? He has set extreme Republicans to howling that Rosenstein must get the axe. There was ample reason for surveillance of Carter Page. He had appeared on the FBI's radar in 2013 when he showed up in wiretaps as being courted by a pair of Russian spies and a Russian banker in New York. He was on suspiciously good terms with Russia which led the FBI to wonder if he had become a Russian agent. In 1998 he had worked for Ian Bremer's Eurasia Group but his vehemently pro-Kremlin views made him not a good fit. He was even outspokenly against Obama and Clinton, which may have been what made him attractive to Trump. The campaign approved a trip to Moscow in 2016. The Steele dossier reported that he was straightaway accorded secret meetings at the Kremlin with top Russian officials, one being the second most powerful among them and a former KGB agent. "Collusion", a recent book by Guardian reporter Luke Harding says Page was offered a deal worth millions if he could get the Trump administration to reverse Obama' sanctions against Russia. Harding's stunning profile of the curious Mr. 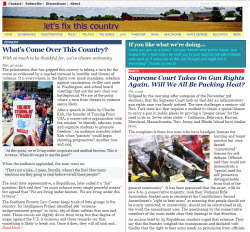 Page is online at Politico. If the FBI shaded their application, amidst a swirl of peculiar Russian contacts by the Trump campaign and admiring comments about Putin by Trump himself, perhaps their worry was that we couldn't afford the FISA court denying surveillance. Trump found his Roy Cohn in Devin Nunes, a representative from California. There are intimations that the White House even helped Nunes with the memo. When Rep. Mike Quigley (D-IL) asked Nunes this question, the chairman said "As far as I know, no", but turned away from answering a follow-up. It was hardly an untoward question. There was a precedent. In March, Nunes was caught out in a clumsy plot he and the president had hatched whereby he rushed to the White House to tell Trump he had discovered documents that would prove  although they did nothing of the sort  that former President Obama "wiretapped" Trump Tower during the transition. "The President needs to know that these intelligence reports are out there and I have a duty to tell him that". The buffoonery meant to exonerate Trump's tweet accusing Obama fell apart when Nunes revealed he had got the documents from the White House itself. You can read the full comedy here. “It’s not a place we wanted to go, but it’s where we had to go”, is how Nunes explained his new crusade. He and the Republicans on his committee voted to forbid release of the Democratic response prepared by the committee's highest ranking Democrat, California's Adam Schiff. There was to be no rebuttal to a text crafted to serve the personal concerns of the president. Nunes even refused the request of the Senate Intelligence Committee's Republican chairman Richard Burr to see the memo. Director Christopher Wray of the accused FBI said he was "provided a limited opportunity to review this memo" only the day before its release, prompting him to express "grave concern about material omissions of fact that fundamentally impact the memo's accuracy". Is the chairman of the House Intelligence Committee in fact working for the White House? California Democratic and committee member Eric Swalwell doesn't pull punches: "He never left the transition team, just by his actions. He continues to work hand-in-hand in trying to protect the president". Schiff puts it more delicately: "The interest of the committee would be far better off with a different chair". "…individuals who have abused that power, it is our job in Congress to shed light on that and bring transparency and accountability to the process. I say let all of it out...the more transparency the better. That's why we think sunshine, transparency and accountability is [sic] the correct antidote for this." Except for letting out the Democrat's rebuttal, that is. The FBI "slow-walked and stonewalled when it came to producing information that the committee was entitled to in the exercise of its oversight" role said one of George W. Bush's attorneys general, Michael Mukasey. He should know, however, that data about pending investigations are not turned over to Congress as part of its oversight role. And in this case, it was still more extraordinary that a member of the leaky House got access to a secret FISA application. It's a violation of the whole compact between the committee and the intelligence community. That compact provides you share with us your closest-held secrets, we'll keep them protected, that we'll protect your sources and methods and we will never abuse this for partisan purposes. That's been broken here, and I think the Speaker [Ryan] is a complicit party in the breaking of that compact". Swalwell says the committee has poisoned the well. "FBI and Justice will never again turn over material of an ongoing investigation to any congressional oversight committee". Ken Dilanian, NBC News national security reporter, quotes his sources in Congress on both sides of the aisle saying that this threatens to "blow up 40 years of congressional oversight of intelligence". "It is the part of intelligence that most needs to keep politics out of the process. And here we have now an injection of hyper partisanship into that process, and I just fear the great damage that will be done to institutions including oversight committees in the Congress, including the presidency, and, of course, obviously, the FBI." Now that it's out there for appraisal, are Republicans taking a balanced view of a memo that reports an important but single omission in an application to keep an eye on a decidedly suspicious person? Apparently not. In the aftermath, the Washington Post reports from a Republican conclave at the Greenbrier resort in White Sulphur Springs, West Virginia, that many of the "rank-and-file" are in the hunt for the scalps of Rosenstein and Mueller. "America’s free and fair elections were being threatened from within”, said Rep. Matt Gaetz (R-FL) . Rosenstein should be prosecuted as a traitor, said another. Trump, on Superbowl weekend, tweeted "This memo totally vindicates 'Trump' in probe… Their [sic] was no Collusion and there was no Obstruction". That absolution could be found nowhere in the memo, but the authoritarian vortex spins on.